About 5 species, natives of the north temperate zone. Besides the following, another occurs on the Pacific Coast. Type species: Streptopus roseus Michx. Leaves glaucous beneath, clasping; flowers greenish-white. Leaves green on both sides, sessile; flowers purple or rose. 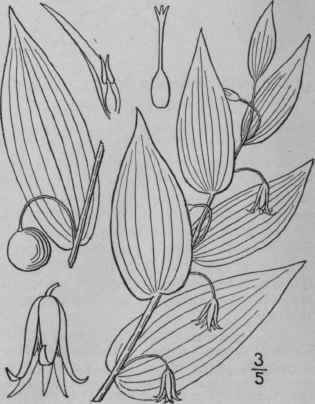 Uvularia amplexifolia L. Sp. PI. 304. 1753. Streptopus amplexifolius DC. Fl. France 3: 174. 180?. Rootstock short, stout, horizontal, covered with thick fibrous roots. 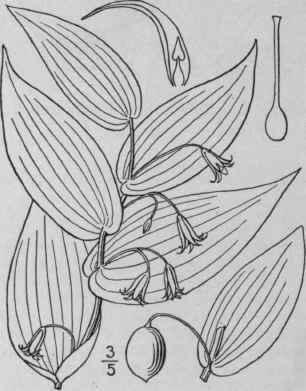 Plant 1 1/2°-3° high; stem glabrous, usually branching below the middle, leaves 2'-5' long, 1'-2' wide, acuminate at the apex, cordate-clasping at the base, glabrous, glaucous beneath; peduncles l'-2' long, 1-2-flowered; flowers greenish white, 4"-6" long; perianth-segments narrowly lanceolate, acuminate; anthers subulate-pointed; stigma simple, obtuse or truncate; berry oval, 5"-8" long. In moist woods, Greenland to Alaska, south to North Carolina, Ohio, Michigan and New Mexico. Ascends to 4000 ft. in the Adirondack's. May-July. Streptopus roseus Michx. Fl. Bor. Am. 1: 201. 1803. Streptopus longipes Fernald, Rhodora 8:71. 1906. Plant 1°-2 1/2° high, from a short stout rootstock covered with fibrous roots, sometimes stoloniferous. Branches sparingly pubescent; leaves 2r-4 1/2' long, acuminate at the apex, sessile, rounded, or slightly clasping at the base, green on both sides, or somewhat paler beneath, their margins finely ciliate; peduncles 1/2'-1' long, usually pubescent, 1-flowered, rarely 2-flowered; flowers purple or rose, 4"-6" long; perianth-segments lanceolate, acuminate; anthers 2-horned; style 3-cleft, the spreading branches stigmatic along the inner side; berry 5"-6" in diameter. In moist woods, Newfoundland to Manitoba, Georgia and Michigan. Ascends to 5600 ft. in Virginia. Liver-berry. May-July. Streptopus oreopolus Fernald is apparently a hybrid between this and the preceding species.